Taking your new baby outside for the first few times can be a nerve-racking experience. You constantly worry if you have everything you need and if you’ve prepared for all eventualities. 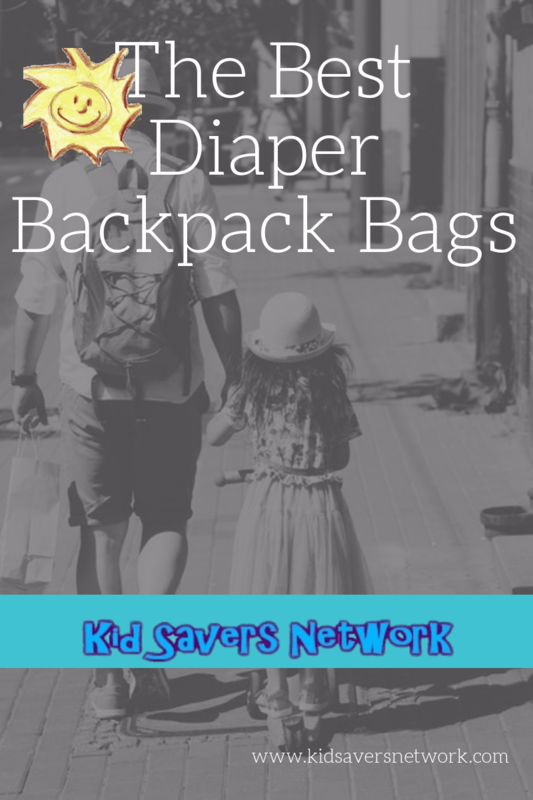 Fortunately, it does get easier and many parents are finding baby diaper bag backpacks to be a great help versus traditional diaper bags. They’re a significant improvement on the tote-bag design because they leave both hands free – which makes things so much easier! 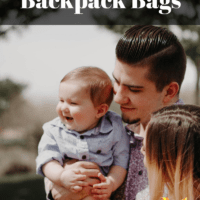 A diaper backpack also provides much more support than most diaper bags, which you’ll appreciate on longer family adventures. Their stylish designs mean they are mostly unisex, too. If you worry that your partner will drop a pink, “Hello Kitty” type bag ASAP – these could also be what you’re looking for! 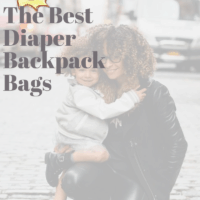 We have taken a look at the best diaper backpacks of 2018 and here are our findings. 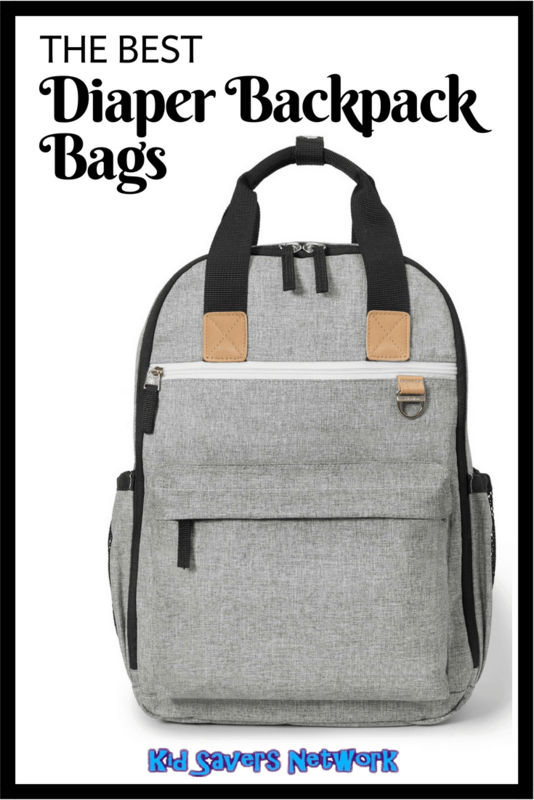 The fourteen pockets were thoughtfully considered when Bag Nation designed this backpack. Allowing moms and dads to be out of the house all day but have everything they need to care for the baby. There’s a dedicated pocket that’s insulated and it doesn’t just hold one bottle, it can hold multiple bottles. There’s also another completely separate pocket dedicated for baby wipes. Making it easy when you shove your hand in the bag to find the baby wipes with ease. You also have multiple choices in carrying the bag. If you’re out for any length of time, carrying the bag on your back could be tiring, or sweaty (if it’s a hot summer day). We really like that it has straps to mount to most strollers. The backpack is modern looking in a way that all moms and dads would be comfortable wearing it on their back. A really well thought out feature is the ability for the backpack to stand on its own, whether empty or full. This is great when you’re in one of those situations where you HAVE TO keep one hand on that squirming baby, leaving only one hand free to rummage around in the backpack. When the time comes to find a baby diaper in the bag, the organization really helps, thanks to the many pockets. And there’s plenty of room for a sippy cup. There are zippered pockets conveniently located right where you want them. They are also constantly innovating. For example, the front flap used to be velcro. If you have a sleeping baby, you definitely don’t want to “rip” that velcro flap open to get something. So Bag Nation upgraded the bag to use magnets. Another improvement was the addition of an extendable keychain. It wasn’t on the original design, but it is now! Others experience has been this is a big, well laid out diaper backpack. Large enough to carry supplies for 2 babies or toddlers. If you like to surf the web while out on excursions, it can easily accommodate a tablet, iPad, and even laptops up to 17″ in size. The shoulder straps have also been mentioned to be extremely comfortable. Water Resistant Twill Polyester. Easy to wipe clean. A few reports of torn seams or poor stitching. But warranty replaced quickly. The Skip Hop Forma lets you carry everything you need and have both hands free to handle the unexpected. It’s also one of the most beautiful designer diaper bags on the market. This diaper backpack is extremely light but has a rigid frame that allows it to be free-standing. Great for when you need to set it down to tend to your little one. The Skip Hop Forma has tons of different compartments. There are pouches designed specifically for bottles, phones and of course the main compartment for diapers. The drink partition is insulated. This helps keep baby bottles and adult drinks chilled on hot summer days. As you’d expect with large diaper bags in this price range, a lot of work has gone into the shoulder straps. They have a good amount of padding so you can pack it to capacity and still be comfortable on your trips outside. Taller parents (5″9 and above) have reported the shoulder straps as being a bit short so you might need to take this into consideration. 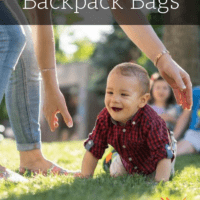 If you’re searching for a well-made diaper backpack that is comfortable with lots of storage and easy to clean, check out the Skip Hop Forma. A similar design is available in blue. You might also consider the Skip Hop Duo if you’re looking for a traditional diaper bag. The Ferline Multi-Function bag is a stylish yet functional baby diaper bag. Its generous size means you can comfortably fit all your baby essentials inside. 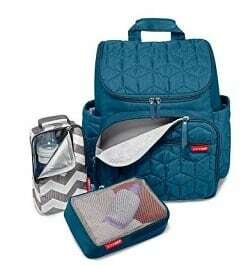 A feature you’ll love about this bag is it has a large diaper changing station. This is great as many public bathrooms still don’t have changing platforms. So the pad makes things more convenient for you, and more comfortable for your baby. The diaper backpack itself is very comfortable to wear on long walks. It’s nice and light too, so you won’t notice it until you need it. As with the Skip Hop model we reviewed, it doesn’t scream “Baby!”. It’s one of those hip, designer diaper bags. Some parents have even used this bag as a regular backpack once diaper duties are over. It even serves well as a dadgear backpack diaper bag. Something you need to know is that it has a top handle as well as regular shoulder straps. Some parents find the top handle gets in the way, as it’s in two pieces and makes closing the bag a bit fiddly. However, Ferline really believes in their product. They offer a 50 day “no hassle” return policy if you don’t like it. There’s also 180-day warranty too. This is above and beyond what their competitors are doing. It’s one of the most stylish baby diaper backpack on the market today. Many parents who prefer larger diaper bags with a changing pad choose this Ferline backpack. It’s not too large that it’s hard to find a baby diaper inside the bag though. You can find the latest price here. TheThe Lekebaby Extra Large Diaper Backpack is one of the most fashionable designs on the market today. And unlike many similar bags, it has stroller straps so that’s a big plus! There’s also a changing pad, too! Its stylish exterior is well made and nicely padded. This is a very large baby diaper bag. Some parents have actually said these diaper bags are way too large. But for many, this will be a big plus, not a negative. For most men, it’s a great size as a dadgear backpack diaper bag. It’s an all around great looking and function baby diaper backpack. The Lekebaby has many compartments and zippered pockets making organization easy. There is an insulated drink holder which will help keep formula warm or a sippy cup. The chic exterior belies the cheap price – these diaper bags look far more expensive than they are. A negative that has been mentioned is some babywipe brands, (especially larger ones) may not fit neatly in the wipes compartment. To get round this, you might have to pack the smaller packets which is a bit of a pain. 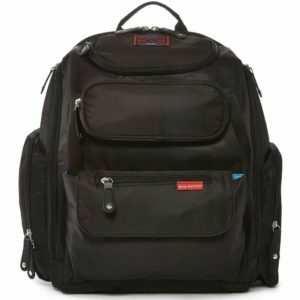 If you’re looking for a large backpack diaper bag with a lot of compartments (18!) with stroller straps, this is the one for you. Check out the latest online price here. The Graco Gotham backpack has trunk-like capacity with a level of style that you wouldn’t expect with baby products. If Batman was going to have a diaper backpack – this would be it! For starters, there’s a large diaper changing pad that can turn any flat service into a hygienic changing station. Baby wipes have their own compartment so you can get to them really quickly. Only Moms know how valuable baby wipes really are, especially in a hurry! Another great feature is the main compartment of these diaper bags zip down. This makes it super easy to get to things like keys, wallets and cells phones which have their own pockets. As you can see, the Graco Gotham bag backpack can be carried like a tote bag or a backpack. A lot of padding has gone into the back and vented shoulder straps. It’s a comfortable bag to take outside on hot and sunny days, and very easy to clean. Unfortunately, there’s no searchlight to bring much-needed help when out with baby! However, with a name like “Graco Gotham”, even Dad’s friends who don’t have babies will find it cool. You also need to know there have been reports over the stitching coming away after 6+ months of use. It’s sad to know that in durability terms at least it doesn’t live up to it’s name. Still, if you’re looking for a large diaper backpack with easy to get to compartments, the Graco Gotham is a good choice at a bargain price. 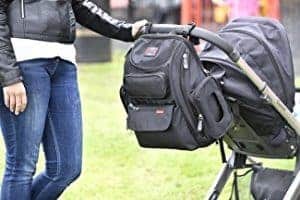 It could well be the best diaper backpack for the money! The Sleeping Lamb Travel Backpack Diaper Bag will haul your baby essentials without screaming “Mr. Mom!”. This slick looking bag backpack may just be among the few baby accessories that turn heads. The padded, breathable padded shoulder straps help keep things comfortable when fully-loaded. It includes four insulated bottle holders and many other compartments and pockets. Made of water resistant polyester, it might not be able to handle thunderstorms, but it’s great for protecting your gear from spills and accidents. It also means it wipes clean very easily. This travel backpack diaper bag is also available in blue polka dots and a flower print if you want a bit more color! On the plus side, it also makes things much easier for you to access, so you need to factor this in. For any price, this is definitely one of the best diaper backpacks on the market. You might also like our page “The Best Baby Carriers for Dad“.